Observations and realizations from my personal journey through this crazy ride called life. Yesterday, late in the afternoon, I bundled myself up in warm layers and ventured outside, no specific destination in mind. Just the intention to get outside and go for a walk. It’s been quite cold in my neck of the woods this past week, which actually made it feel more like a month (some might even argue this past frozen week has felt like a year in and of itself). But the mercury had climbed enough yesterday afternoon to make it humanly possible to go outside, with plenty of extra clothing to pad my flesh against the harsh sting of the cold, of course. I had been longing to be outside, to breathe the fresh, crisp air into my lungs. And so I walked, putting one foot in front of the other, focusing on my breath, and feeling the steady beat of my heart inside my chest. I walked. At some point, each of my footsteps naturally and effortlessly synchronized with an inhale or an exhale. I walked in perfect rhythm and harmony with myself, each step a sacred partnership of movement and breath. Not tiptoeing and not sauntering. Neither crawling nor running. I walked, briskly and with intention, guided by inspiration and my intuition. Call it symbolism or metaphor if you like, but I prefer to think of it as my new reality. Intention – The deliberate approach I am consciously choosing for myself, to be all in for my own life. I like to think of intention as the opposite end of the spectrum from chance and coincidence. Sure, there’s always room for a little spontaneity, but I plan to begin each day with a strong intention to guide me. Intuition – Trusting the quiet whispers from my heart and my soul, even when they don’t make sense. I am learning how it really is that simple. Intuition is like a muscle: the more you listen, the more you hear. I am listening. Inspiration – Allowing the world’s beauty, emotion, and passion to fill my heart so full that I have no choice but to create something just as beautiful myself, as a way to express my gratitude and appreciation for all that is. To live an inspiring and inspiration-filled life, and maybe even to inspire others along the way. Taking in the first few deep breaths of crisp winter air as I walked made my nose run and cheeks rosy, but it also brought warmth and brightness to my soul. And perhaps the most beautiful thing of all is that I really don’t know where any of this is going, or where I’m going. But what’s more important is how, through willingness and an open heart, I’m learning to practice the art of surrender and to trust my journey. I am grateful for the New Year that is now upon us; for the perspective and the clean slate it affords. Even if all of this is just a silly notion generated by my overactive imagination, it feels real. I am realizing there is an untapped energy source that has been resting dormant inside me. A swirl of ideas are fueling a renewed sense of curiosity, and a zest for experiencing the fullness of life is starting to take shape. My path is not clear, and I really have no idea where I’m going. I suppose it’s possible, and even quite likely, that I could take a wrong turn. In fact, I could get very lost. I could get it all wrong and make terrible mistakes along the way. I could continue to be paralyzed—stuck in place—frozen by all-consuming fear. Or, I could walk on in spite of the obvious challenges and risks. I choose to walk forward, one bold step at a time, along with my three faithful companions: intuition, inspiration, and intention. There’s no way of knowing for sure what this year has in store, but I’m excited to take the walk. What are you excited for in 2018? I’d love to connect with you! Drop me a line and let’s chat about what dreams and schemes you’re cooking up for the future. Our family pet is a 15-year-old Bichon Shih Tzu named Rocky. He was my first baby, really. I brought him home from the pet store cradled in my arms. He thought he was the alpha dog, and I flipped him on his back and told him in the most stern voice I could muster, “no,” to assert my dominance. Not long after we got Rocky my husband went out of town on a business trip. Rocky whimpered and cried all night long from the confines of his small kennel, which we had been told was the safest and most comfortable place for a small dog. I wasn’t getting any sleep with the way he was carrying on, so I made the decision to bring him into bed with me and he immediately stopped. And Rocky’s been our bed mate ever since, officially a member of our pack. And he and I have been the best of friends ever since. It has been tough to watch Rocky’s health deteriorate as he advances in years. He is no longer the playful puppy he once was. He is moving much slower these days. His eyesight is failing. We’re pretty sure he has arthritis in his hind legs and hips. He chatters his teeth involuntarily, and at times uncontrollably. And there’s no refuting that he has the absolute worst doggie breath on the planet. Despite his handsome, youthful appearance, Rocky is 105 years old, and while I really don’t like to admit it, he has officially become an old dog. He sleeps most of the time, probably close to 22 hours a day. He no longer jumps on or off our bed, and insists on being carried down the stairs in our two-storey home. He’s recently become a little more skittish, tentative, and even ornery on occasion. He doesn’t hesitate to let us know when he needs help with his relentless barking (normally he’s a very quiet dog), or when he doesn’t like something, such as the way he’s being touched or carried, by letting out a high-pitched yelp. Ultimately, this little dog lives and loves with all his heart. Unfortunately, neither pets nor people are promised forever in the physical bodies we’re given. Sometimes as we age our bodies fail us. And sometimes, through the miracles of modern medicine, our failing bodies can be repaired. But we’re never given any guarantees. Be grateful for the time you have; regardless of what it looks like and however long it may be. We all have the choice to live everyday as if it were our last. Make every moment count, because how we show up for ourselves and each other truly matters, and you simply mustn’t take your time on this earth for granted. Always be yourself and speak your truth. Don’t change or temper your personality to suit others. Express your needs honestly and directly. Kindness and compassion are potent antidotes to the prevalence of hatred and fear. The added bonus is that they’re both renewable resources, so you can go ahead and apply them generously in everything you do. Learn to keep your heart open to the energy of love, rising above petty jealousy and anger. Love is powerful. Take every opportunity to show (and tell) the people you care about how important they are to you. Live with a soft, open heart, everyday, no matter what circumstances come your way. Herein lies both the greatest test and the true meaning of life. They say you can’t teach an old dog new tricks, but I’d say the lessons I’m learning from my old dog are more important. Clearly, Rocky is so much more to me than merely a family pet or an old dog. He’s an important member of our family, my constant companion, and a very wise soul who most certainly came hère to teach me a few tricks about life, and not the other way around. I’ve spent a lot of time focused on self-improvement and personal growth over the past five years. I’ve made no secrets about this. My own physical fitness has been a significant part of this journey, and I’ve tried a number of different approaches. I’ve been quite open about my love affair with movement. I’ve done outdoor bootcamps, running, group fitness classes, yoga, and a whole bunch of different home workout programs. But what I’ve never really talked about openly before is how I’ve done a lot of different things with the goal of making my body into something it’s not, and may never be. How I’ve tried with all my might to take up less physical space in the world, with all of my efforts stemming from a deep-seated desire to correct my perceived flaws and imperfections. Despite successfully losing nearly 20 pounds and close to as many inches in one particularly rigorous cycle of diet and exercise a few years back, buying into the vanity side of the health and fitness industry has left me hollow and jaded. I think I may have actually lost a piece of my soul as some of my fat melted away, but then it just came back again, with a vengeance (the fat that is, not my soul). The worst part is, at the end of it all I still feel as though I don’t measure up to society’s expectations, or my own. I’ve been on this tireless quest to reshape my body into something that more closely resembles the ideal woman, with toned arms, flat stomach, firm legs, and of course, a thigh gap. But after trying and trying and trying, reaching and striving, grasping and clawing my way through the thick of my own dissatisfaction with myself, I just have to say I’m tired. Like, exhausted. At the risk of provoking some and offending others, I’m just gonna go ahead and say what’s on my mind: dieting and exercising for weight loss and vanity alone is shallow and short sighted. That’s the simple truth. And I’m pretty sure those who go at it from this angle will find themselves in the same position of repeatedly regaining the weight they lose, just as I have. Because as long as we’re not addressing the underlying issues— the reasons why we eat crap, or don’t eat enough, and don’t move our bodies enough—we’re only masking the problem with a temporary band-aid. The diet and weight loss industry is built on the fear and desperation of the people it serves; it preys on our vulnerabilities. The industry knows we’re all looking for a quick fix, and that’s why it packages up the promise of a better life for us in a shiny, irresistible package. The industry knows we’ll come back time and time again for more after the initial promise stops working. The industry knows there’s no such thing as a magic pill, but will sell one to us anyway. The long and the short is that anything that’s promising you extraordinary results in a short period of time is too good to be true. Period. These are the lies we believe when we’re afraid we’re not enough as we are. This is the garbage we buy into when we don’t love ourselves, because we are motivated by our fears. In my attempt to see this situation from all possible perspectives, I’ve run the full gamut of emotions—from frustration to anger and despair to resignation. And I suppose you could say I’ve reached a metaphorical crossroads in deciding that it’s time for something to change. The world around me isn’t going to budge, so I guess it’s up to me. The only thing that makes sense to me at this point is the realization that taking care of myself needs to come from a place of love, rather than being instigated by my feelings of insecurity, my hatred of my thighs, and the fear of not being good enough. Let’s face it, exercise is not punishment for what I look like, or what I may have eaten last night. And it most definitely is not something I should engage in from the standpoint of being disgusted by what I see when I look in the mirror. As I’ve already mentioned, I’ve been guilty of this attitude in the past, but I’m really starting to see not only how damaging this is to my mental health, but also how counter-productive it is to continue down this road. The ability to move my body is a privilege not everyone has in this life, and is something not to be taken for granted. I want to move my body in ways that feel good to me. I want to take the best possible care of myself. I want to feed myself healthy, nutrition-dense foods, because my body—my physical container during my time here on earth—needs the highest quality fuel to function optimally. So, if I know what’s good for me (and I’m starting to think I do), I can see how approaching nutrition and exercise as self-care, coming from a place of love instead of fear, could make all the difference. Instead of exercising because I feel like I’m not enough the way I am and feeling desperate to change what I don’t like about my body, I need to change my mindset, instead. It’s a strange place to be in, and one that I’m not sure I entirely understand yet, but my goal is to cultivate the energy of loving myself as I am right now while being open to improving my health and wellbeing at the same time. I am active because I love myself. My body deserves to be treated well. I feel good when I move my body. I nourish my body by eating whole, healthy foods. As I’ve already suggested, the reasons for leading a healthy, active lifestyle run way deeper and are far more meaningful than vanity alone. And according to one article I found online, thinking of exercise as beneficial for reasons other than weight loss helps people stick to exercising more regularly—about three more hours per week than people whose primary focus was solely on weight loss. With this in mind, I’ve come up with the following list of reasons to exercise that have absolutely nothing to do with weight. Breaking a sweat is super healthy, as it allows the body to release excess sodium, keeps blood pressure in check, and rids the body of some environmental toxins. Just remember to rehydrate with plenty of water during and after a good sweat session. Increasing your heart rate with exercise strengthens the muscles of the heart, as well as reduces the risk of heart disease. With heart diseases and other related conditions on the rise, this is a very compelling reason to look after the health of your ticker. Any weight-bearing exercise, such as running, dancing, or resistance training, will help with bone density, thereby reducing the risk of fractures and osteoporosis that increase with age. It has been scientifically proven that those who exercise regularly actually live longer. Just 150 minutes of exercise per week (that’s just five, 30-minute sessions) can add up to seven years to your life. If you’re feeling fatigued or lacking energy, consider that exercise can leave you feeling like you have more energy thanks to the effect of endorphins—the feel-good vibes and rush you get after exercise, also known as “runner’s high”. Stressed out? Working out helps manage and release stress by battling cortisol, the stress hormone. Feeling blue? Exercise is a natural antidepressant and mood lifter, improving overall mental health and helping stave off symptoms of anxiety and depression. Aerobic exercise can reduce both the physical and emotional symptoms of PMS, alleviating mood swings, depression, fatigue, cramps, and even balancing out hormone levels. Regular exercise promotes improved restful sleep, lowers incidence of insomnia, and promotes higher quality of sleep. The habit-forming power of a consistent exercise routine is transferable. Some notable improvements you may notice as a result of engaging in regular exercise include increased ability to focus on tasks, boosting creativity, and fostering greater productivity in many areas of your life. It seems to me these are the real and meaningful reasons to treat yourself well with regular exercise. It all comes down to putting yourself first. Loving yourself and being good to your body are the only “why” you need. So for the love of all that is good and holy, can we just give the diet and fitness industry (and all the superficiality and lies that go along with it) a great big collective middle finger? Can we all agree it’s time to break up with the idea of being defined by our weight, measurements, and dress size? And wouldn’t it be nice to just go for a walk or ride a bike or do some other type of movement that feels good to us, and maybe eat a few extra veggies somewhere along the way today? How awesome would that be? I’m kind of done with hating myself. I know it may seem quite radical, but I’m going to try loving myself from now on and see where that takes me. As always, if you have any thoughts to share, I’d love to hear from you in the comments below. If my nutrition is off, why should I bother trying to fit in exercise? I haven’t really been on my fitness game, so I’m just going to have that heaping helping of ice cream after dinner. Sure, I’d love to help myself to a giant handful of crunchy, salty chips. I often drink too much coffee. Rarely do I drink enough water in a day. My irregular sleep habits are wreaking havoc on my body. Thanks in large part to my all-or-nothing patterning, I’ve repeatedly made the mistake of trying to make too many sweeping changes all at the same time in the past. As you might expect, this approach has only resulted in frustration when I inevitably fall off of the proverbial wagon midway through the first week. What if I set one small, manageable goal per day for seven days? This one simple idea—that seemed almost too simple—might just be the golden ticket to getting me started with making the positive, healthy changes I want and so desperately need in my life. One week. Seven days. Seven goals. Monday – I decided I would wake at 6:00 a.m. instead of my usual 7:00, 7:09, and 7:18 sleep-snooze cycle. I set my alarm the night before, and to my surprise I woke up naturally, before then alarm went off, at 5:57 a.m. Also to my surprise, I didn’t feel overtired throughout the day. Instead, the extra hour in the morning gave me time to focus and get organized, which allow me to be more productive throughout the day as a whole. My take-away: From this one day I could easily see how being an early riser offers many benefits. For me, the key to successful early waking is to ensure I get myself to bed on time. That means lights out at 10:00 p.m. This is definitely one healthy habit I plan to work on cultivating further. Tuesday – I’ve tried, with mixed success, to eliminate coffee from my diet on a number of occasions. I even wrote a blog about it here. With that idea lurking in the back of my mind once again, I opted to swap out my usual morning java for a traditional home brewed yogi tea, which is made from black tea and therefore still contains caffeine. According to Ayurvedic medicine, though, the spicy brew is believed to offer a variety of amazing health benefits, including helping with digestion, strengthening the nervous system, increasing energy, as well as supporting joint health and mental health. My take-away: I enjoyed the yogi tea both for its flavor and health benefits; however, it took quite a bit of work to prepare. I could definitely see myself making yogi tea from time to time going forward, but I think it might be more practical and realistic to consider reducing my coffee consumption to a maximum of two cups per day, limited to the stuff I brew myself at home in the morning, rather than eliminating coffee from my life altogether. I think that might be what they call balance? Wednesday – I chose no complaining as my change challenge and goal for Wednesday. I’ve done a lot of work over the past few years to steer clear of this dangerous habit, and since I knew I was going for a morning run with my friend and my husband would be away on a business trip, I would have had the perfect motive and opportunity to get sucked into a black hole of complaining. Instead, by setting the intention and staying mindful of the gravity of the ego’s desire to air grievances in front of a sympathetic audience, I’m happy to report I made the choice to lean into the positives. My take-away: My life is better and so much happier when I do not dwell in negativity; when I don’t allow myself to indulge in the habit of complaining. Like everything else in life, this is a practice. But with focus and mindfulness, it gets easier over time. I’ve simply come to the point where I’d much rather build my positivity muscle with a focus on gratitude, rather than my negativity through complaining. Thursday – Knowing it was a school holiday and my kids would be at home with me, I was looking to get a positive start to the day. In the morning, I invited them to put their electronic devices down and do some yoga with me. My take-away: Have you ever heard the saying: You can lead a horse to water but you cannot make it drink? Similarly, you can invite your children to do yoga, but you can’t make them stay and do it with you. This endeavor was a serious exercise in patience for me. I think my daughter lasted about four minutes, and, surprisingly, my son stuck around for about 12. It didn’t take long for me to remember it’s best for everyone if I don’t have any expectations around their participation. After all, they are 10 and eight years old, and they have their own personalities, agendas, likes, and dislikes. And that’s ok. This yoga momma will let it go and maybe try again another time. Friday – I’m a food lover and breakfast ‘eater’, through and through. Those who know me well will probably have heard me say I prefer to eat my food vs. drinking it, but I had a few different reasons for wanting to try a smoothie bowl. Of course, I wanted to see what all the hype was about, plus I’m always looking for ways to get more vegetables into my diet. And finally, I recently came across an article that basically touted the breakfast smoothie bowl as a healthy sundae, so I figured I couldn’t go wrong. My take-away: This was a good idea, in theory, but the execution was definitely lacking. The recipe I used called for a frozen banana, so I used one of the many I have on standby for making banana bread in the freezer. This, in a nutshell, was the problem. The smoothie bowl tasted like freezer burnt banana. EEEEEEWWWWWW! I am happy to report I have since tried again with a non-freezer-burnt frozen banana, and thankfully it made a world of difference. The fun toppings are where it’s at and are what will bring your smoothie bowl to life. Using a variety of different flavours and textures for toppings is a great way to add interest, so go ahead and get creative! (I used fresh berries, shredded coconut, Chia seeds, and sliced almonds.) Green smoothie bowls have already become a once per week staple for my husband and I at breakfast. Saturday – This was the day I wanted to try a new recipe for dinner, and One-pan Honey Mustard Chicken and Potatoes was just the thing. This sweet and savoury dish offers the added bonus of being cooked all in one pan, which makes preparation and cleanup way easier. Yay! My take-away: Sometimes I get stuck in a rut of making the same meals over and over again, which gets boring and tired. It’s nice to try new recipes from time to time, and if they turn out to be a crowd-pleaser in my house, they might just make it into a regular rotation. My husband and I both enjoyed this recipe, but unfortunately my kids were not as enthused (who knows why: they’re kids, they’re weird, they don’t like mustard?). Sidebar: taking time to meal plan and ensure you have all the proper ingredients on hand can be a lifesaver, particularly for busy nights, which is pretty much every night when you have kids. Sunday – My intention for Sunday was to get on board the train at the Hydration Station first thing in the morning and then ride that train all day long. I actually don’t mind drinking water, but my greatest barriers to doing so are 1) remembering to actually do it, and then 2) ensuring I’m never far from a washroom. So I filled up my water bottle and drank, and drank, and drank as much as I could throughout the day. I estimate drinking about three 17 ounce bottles of water, which still falls a little short of the suggested daily intake. My take-away: I know how much better I feel when I drink water and how yucky I feel when I don’t (tired, headachy, sluggish digestion, etc.). I still have quite a bit of room for improvement when it comes to drinking enough water each day, but I also need to cut myself some slack, because drinking some is better than drinking none, or worse yet, filling up my bladder with coffee and other liquids instead. I will continue to focus on drinking water, and planning to be within 50 metres of a washroom at all times. And if I don’t quite reach my water quota every day, that’s ok, too. Start with small, manageable changes. Avoid overwhelm and maximize success by choosing only one or two things to focus on at a time. Wait until changes are well established into your routine before adding more to your plate. Be gentle with yourself, and remember that progress is more important than perfection. When things don’t go as planned, pick yourself up, dust yourself off, and start over again. A good sense of humour and lots of self-compassion are huge assets. After this week-long experiment, I can literally see how change is a process that inherently contains both progress and setbacks. Change isn’t all or nothing and it doesn’t need to be. But starting small and focusing on only one or two manageable things at a time, instead of getting swept up in the all or nothing mentality, is a great way to build positive momentum and set the foundation for success. 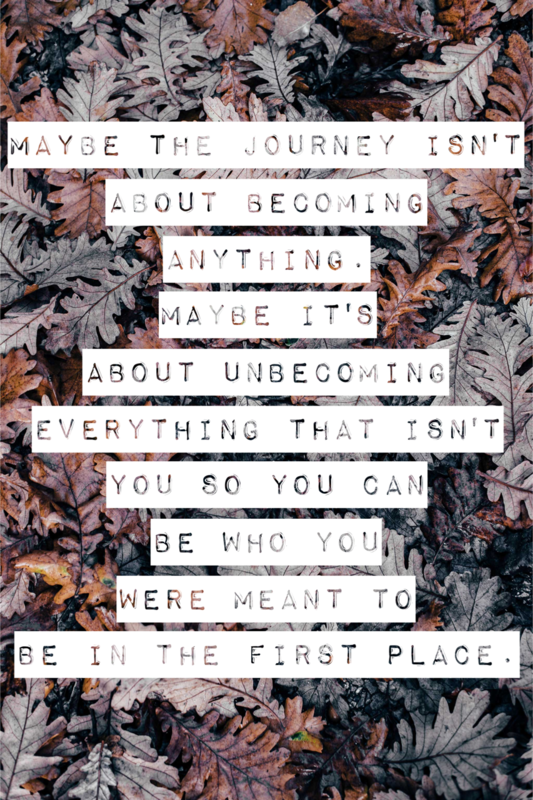 Truth be told, I’m hoping I’ve stumbled onto the secret-sauce-for-me mindset that will help me foster healthy, lasting changes (at least until they don’t and I have to start again). With that, here’s to getting plenty of rest, reducing my caffeine dependency, focusing on the positive, releasing what I can’t control, eating plenty of veggies, trying new things, and drinking all the water…forever and ever, Amen. And most importantly, to remembering there will be days when I simply can’t do it all, for one reason or another, and on those days I will remind myself that I’m ok and I can try again tomorrow. What changes would you like to make in your life? What have been your successes, setbacks, and learning? I’d love to hear from you in the comments below. If I were to pick only one word to describe my life, one word to sum it all up just perfectly, it would have to be: Resistance. Many of the people, circumstances, and experiences I encounter, I resist. I oppose. I withstand. As far as I can tell or remember, I’ve been resisting most of my life, and if someone were to make my life into a book or movie, it would have to be called, The Great Resistance. When it comes to actually feeling all my feelings, receiving feedback, and trying new things, my first and natural reaction is to resist. I resist listening to and following my intuition, being consistent with self-care, and accepting love that is offered to me. Allowing myself to fully participate in positive experiences and doing what I know is my calling? Yup, you guessed it—even more resistance! And when I encounter struggle or conflict, I put up resistance with a capital “R”. As you can see, I take resistance to a whole new level. You might even say I’m the master, Grand Puba, and high priestess of the resistance department. I am literally resisting my own life, and I’ve come to the conclusion that it’s a bit like trying to sprint through Jello. If you’re wondering how that’s working out for me, well let’s just say it’s not really. I have enough self-awareness to know that simply being aware of my resistance is no longer copacetic. Capiche? (You know what I mean?) The Great Resistance is preventing me from experiencing sustained joy and happiness and blocking me from finding my flow, ya know? I had a little A-HA! moment when I realized: The flip-side of resistance is acceptance. This is BIG, life-changing stuff here, people! I’m not talking about taking the road of acquiescence, passivity, or even resignation. I’m talking about being able to take whatever comes my way for what it is. Greeting every moment with interest and curiosity, rather than judgment. Setting aside all of my expectations and preconceived notions about what my life should look like in favour of receiving whatever it is. And believe me when I say that for me this is as much about allowing the good stuff as it is about welcoming the negative without a bunch of unnecessary drama and hoopla. What I need, and what I’ve been searching for all along, is acceptance. I have a choice: I can continue to cause my own suffering by resisting everything, all the time, or I can choose to walk the road of acceptance, instead. Resistance is a close cousin of fear, so it only makes sense that acceptance is one of love’s siblings. With this massive revelation, I’m setting my sights on seeing my resistance for what it is (essentially, fear in disguise), and gently moving beyond it to a place of loving acceptance—in all ways and with all things. Starting right now, I am choosing acceptance over resistance, and committing myself to making acceptance a daily mindfulness practice. I will practice accepting whatever comes my way. I will practice letting go of things I cannot control. I will practice seeking solutions instead of complaining. I will practice listening to the whispers of my sadness, pain, anger, and frustration. I will practice seeing the beauty that exists in the world. I will practice gratitude and focus on positivity. Yes, I do get it now. I accept responsibility for myself—all the good and bad parts. I accept that I’m human, and I will have both good days and bad days. I accept that acceptance is a practice. I accept that this is where I begin. Breathe in. Breathe out. Repeat the practice of acceptance, times infinity. Has anyone else chosen to walk the road of mindful acceptance? Do you have tips, an experience, a story, or a comment to share? I’d love to hear from you. Feel free to drop me a note in the comments below.